One of my guilty pleasures is to look at cooking videos. On youtube… like Iron Chef America… I love how on youtube you can find lots of different things. I ended up finding a youtube channel called Cooking with Dog which is a really amazing channel. The thing I like about it is that it specializes in Japanese cooking, which is something I really want to learn. I hope one day to live in Japan, at least for a year, so I like being exposed to the cuisine through this channel. So on Saturday I was looking through the videos and saw a recipe for Mapo Tofu (which is a Chinese dish that is popular in Japan). It looked really good, and I had been looking for a recipe that involved tofu. Anyways, so on Sunday my boyfriend and I decided to make it and it actually turned out really well! I was nervous to make this recipe as Asian cooking sometimes intimidates me. I don’t really know why, I think because it seems like there’s a lot of different components of a dish without a lot of time to do it all. I know when I have made stir-fry in the past it just seemed like everything only had a certain amount of time that it could be completed in. However, this recipe ended up being pretty simple, though at one point there it was a little intimidating how quickly everything needed to be done. This was a lack of planning on my part as I hadn’t prepped the wet ingredients. I was really grateful that my boyfriend was cooking this dish with me. We ended up tag-teaming this dish so that he was doing all of the cooking parts, while I would get everything ready for him and place it in the pan when the time was right. This recipe was fantastic, and my boyfriend said that this was probably one of the best things we’ve ever cooked. I have to say that I agree, it was fantastic. There ended up being a bit of an adventure with this recipe as we found it really difficult to find the ingredients. I went to two separate grocery stores, but neither carried the douboujiang or tian ming jiang sauces that we needed. We ended up going to an Asian grocery store (which is really where we should have gone in the first place in retrospect) and we were lucky that they hadn’t closed. So, if you live in a small town like we do, go to a specialty store unless you have a great grocery store. I had a hard enough time getting my grocery store to carry extra firm tofu. Anyways, here’s the recipe! Take the tofu out of the package and drain. Wrap it in a heavy paper towel and place a heavy plate on top to get rid of excess water. This process takes 20 minutes. Weigh out your pork so that you have 100 g of pork. Chop up your garlic, and ginger so that you have 1 tbsp of each. Chop the chives. Put these aside for later. Boil 150 mL of water to make the Chicken stock. Put this aside. Dissolve the potato starch in twice it’s volume of water. After twenty minutes, unwrap the tofu. Cut the tofu horizontally in the middle to make two blocks. Then make vertical slices one way on the tofu, and then the other way to have three quarter inch cubes. Heat up a pan to high heat and put your sesame oil in the pan. Distribute the oil evenly on your pan. Then stir fry the pork at high heat (break it into small pieces). Once the pork is throughly cooked, add your chopped ginger and garlic. Reduce the heat to medium and cook until aromatic. Move the pork to one side and make extra space on the other side of the pan. Place your douboujiang and tian mian jiang sauces on the pan and stir quickly to avoid burning. Mix them together and stir fry until evenly brown. Add 1 tbsp of sake, and stir until the moisture disappears. Add the chicken stock, soy sauce, and the reserved 1 tbsp of sake to the mixture. Gently stir. Add the tofu cubes, bring the sauce to a boil at high heat. Once it begins to boil, simmer for 2-3 minutes at medium heat (helps get rid of the tofu’s moisture to absorb the flavour). Add the chives and gently stir. Take the pan off of the heat and add the dissolved potato starch to the mapo tofu. Gently mix the mapo tofu. Heat at high heat for 30 seconds. Take off of the heat and you’re done! This recipe was simple to make, but again it had a lot of different components. I didn’t have the wet ingredients pre-done so that was part of my rushing. We ended up eating the Mapo Tofu with jasmine rice, and it was just so good! I remember thinking that 100 g of pork wouldn’t be enough, but I had forgotten about the tofu. The tofu itself was good, though we used extra firm tofu (it called for firm). I think that if we had used firm, the sauce would have been able to infuse better with the tofu. We also thought that maybe next time we would use a little less tofu, or at least cut it into smaller pieces because we’re still trying to get used to the texture/taste of it. However, it was really delicious and I was so glad we took a chance and made this! We ended up having left overs so tomorrow my boyfriend will probably take it to work for lunch which makes me feel good! If you’re intimidated by Asian cooking like I was, definitely give this recipe a try. It seems like it’s a lot, but if everything is prepped then you should be fine! No rushing around! I would say that this recipe probably took about 40 minutes from prep until finish. So it wasn’t too long to eat delicious Mapo Tofu! Haha, I’m with you there, although my pleasure would be reading food blogs, especially when I don’t feel like writing a paper (which coincidentally, is happening right now). 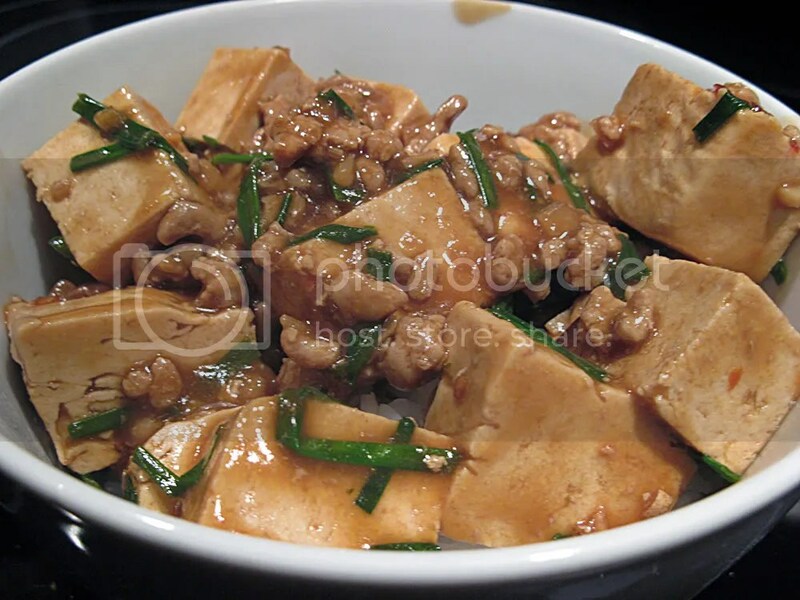 I’ve always heard of mapo tofu, but have never tried it. Perhaps it’ll convince my tofu-banishing friends with all of its jiggly goodness ;] Looks yum. The Mapo Tofu was really good, I enjoyed it. I think it may have been better with firm tofu, but I think I’m just trying hard to -get- into tofu lol. But yeah, there’s some great tofu recipes out there. I converted my boyfriend, I’m sure you can convert your friends! I mean, it really has very little taste on it’s own, it’s all about marinading and what you flavour it with. I would be glad if you take a look and my Blog and I’d feel so honoured if you want to follo me.